A miles of smiles bike photo of a family enjoying the trails around Mankato, MN on the River Ramble Bicycle Ride held each October. This entry was posted in Picture of the Day and tagged #nextbikeadventure, #onlyinMN, Bike Mankato, Blue Earth County, MN trails, Red Jacket Trail, Road Biking Minnesota, Sakatah Singing Hills State Trail on May 29, 2016 by Russ Lowthian. The allure of bringing your bike to Mankato offers a lot of possibilities. Here as the Minnesota River bends to the north to meet the Mississippi in St Paul, the scenic valley here offers miles of biking memories for all levels of adventurists. Its a fun destination to consider for your next bike touring adventure. 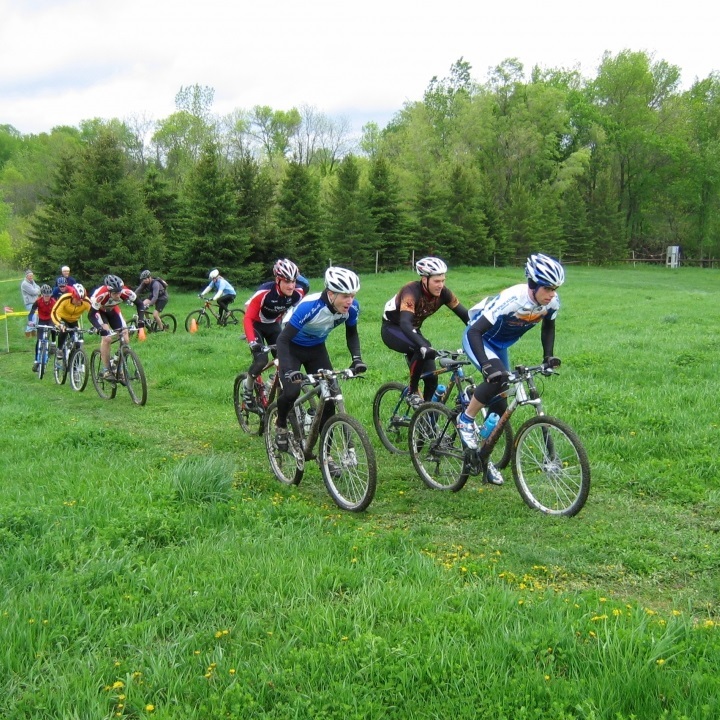 Mountain bikers having fun at Mount Kato. The city was named for the English translation of mahkato – the Dakota word for the area’s greenish-blue, claylike soil of the area. 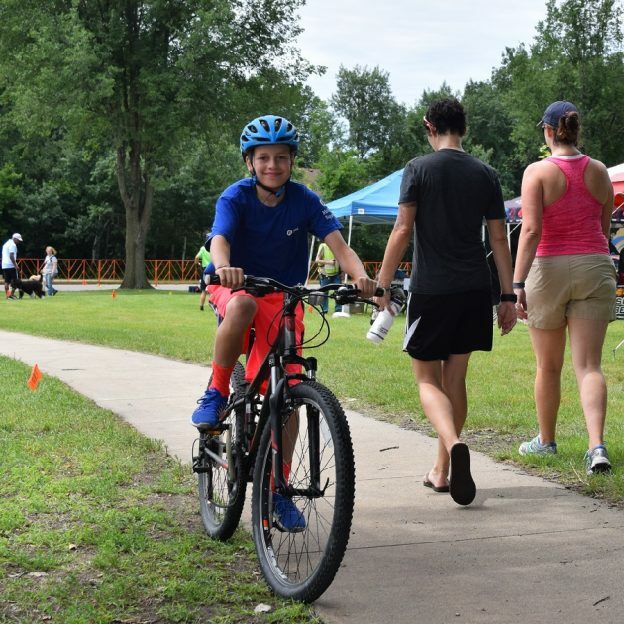 Today as a bike friendly community, recognized by the League of American Bicyclists, Mankato is bicycling hub offering miles of paved trails that connect to the town’s designated on-street bike routes and mountain bike areas. See more information and maps at our At-A-Glance Mankato article at HaveFunBiking.com. Once you have selected one of the bike friendly lodges in the area it is easy to park your car while visiting and commute by bike. If you need a rental, help shipping your bicycle in or making a few adjustments most of the local hotels work with the area bike shops to help accommodate your needs. From a hotel that you have selected, you will find many picturesque routes to ride with family members or friends that take you to area attractions and fun place to eat. 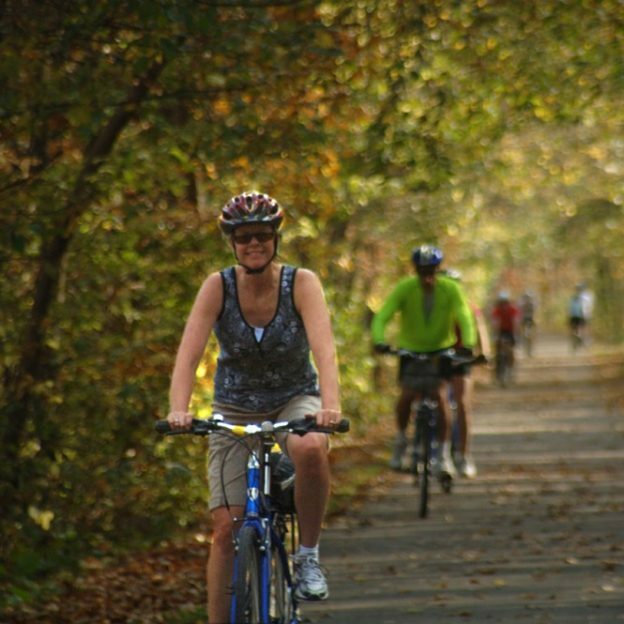 For the trail rider, enjoy over 50 miles of family-friendly paved trail in town, on the Red Jacket and the Sakatah Singing Hills State Trail. Road touring enthusiasts will find a network of suggested scenic routes with wide shoulders on low traffic roadways. And thanks to the work of a devoted group of local mountain bikers the area continues to grow as a premier off-road biking destination. When you are not biking, Mankato is also a hub for arts, entertainment, great food and nightlife. After exploring the Minnesota River Valley’s bicyclists will find a strong local food scene. Here restaurants in the area and nearby neighborhoods serve everything from delicious pizzas, creative burger creations, finger licking ribs, to ice cream treats and local craft beers. 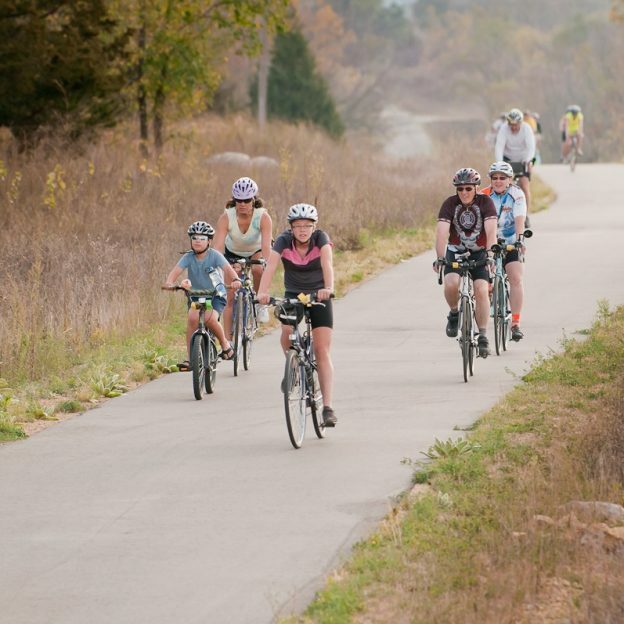 Try Mankato for your Next Bike Adventure or see more opportunities in the Minnesota Bike/Hike Guide. This entry was posted in News and tagged #nextbikeadventure, #onlyinMN, Bike Mankato, Blue Earth County, MN trails, Red Jacket Trail, Road Biking Minnesota, Sakatah Singing Hills State Trail on May 24, 2016 by Russ Lowthian. 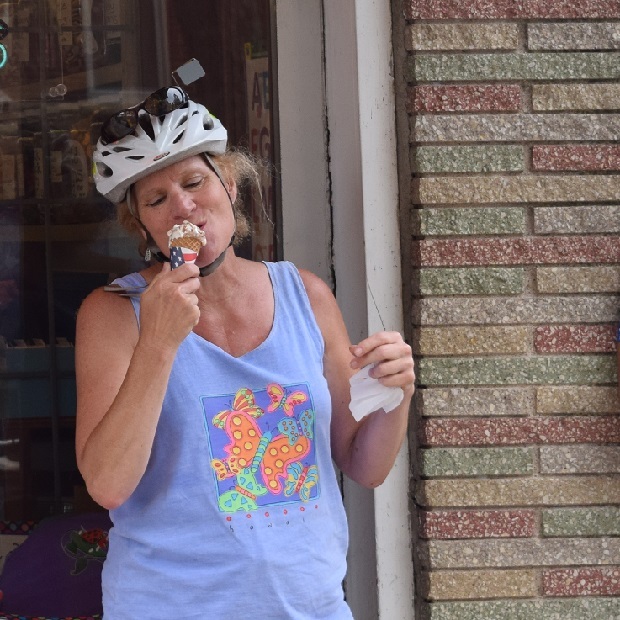 After riding her bike several miles on the Sakatah Singing Hills State Trail, near Faribault, MN, this cyclist found the local ice cream shop downtown sinfully delicious. 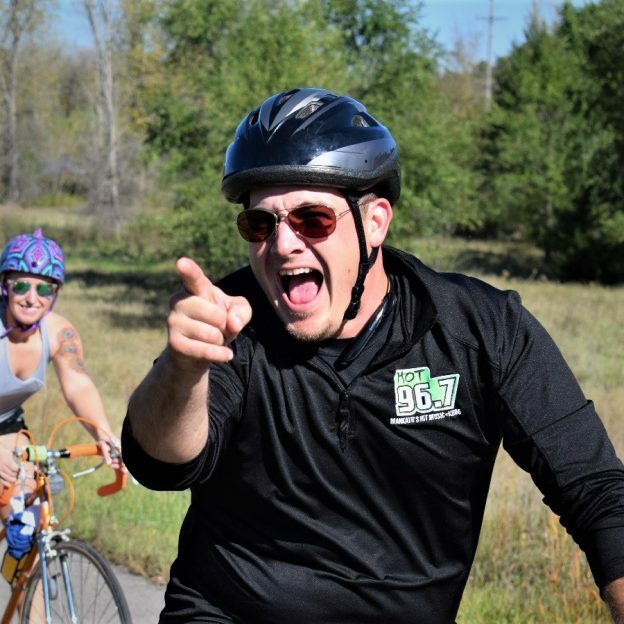 Find out more about visiting Faribault’s bike friendly roads & trails and orgasmic treats here. Thanks for viewing the Bike Pic of th e Day here at HaveFunBiking (HFB). 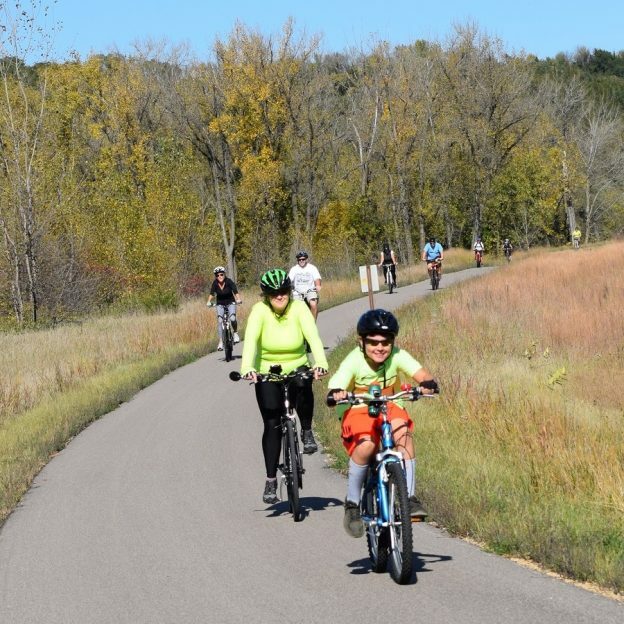 This entry was posted in News and tagged #FindYourNextAdventure, #onlyinMN, Faribault, Ice Cream Smiling bicyclists, MN, MN trails, Orgasmic treats, Road Biking Minnesota, Sakatah Singing Hills State Trail on February 19, 2016 by Russ Lowthian.